Hi everyone, i'm back from my little traveling and i am so burn out from the trip. I really missed having internet access and blogging. 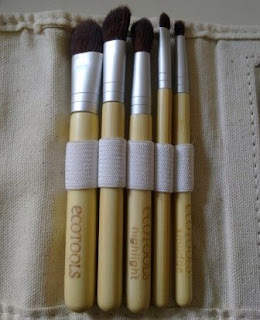 Anyway i packed the Eco Tools eye brush set along with me for the whole trip and am now confident to do a review and tell u guys how i felt about it. So, before i go deeper into each brush, i will just do my conclusion first. "I absolutely love them. I think everyone should have a set. It is soooooooo convenient to bring along when u're traveling." Yup..that is what i felt about the brushes during my trip. I bought this set here. It is a very affordable set and retails at USD$7.99. This set comes with 5 eye brushes and a carry case hence 6 piece in total. It is made from natural and recycled materials and are cruelty free. I took the description of each brush from the website and thought i'll just show it to u guys here. 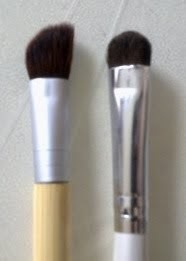 On the handle of the brush, they named it as a blend brush. 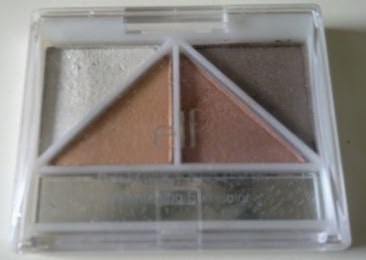 I've been using it as an eye shadow and highlight brush to pat the shadows onto my eyes. 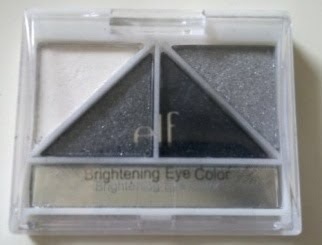 As u can see from the pic, it is rather big as compared to the ELF eye shadow brush which makes patting shadows really fast and easy. 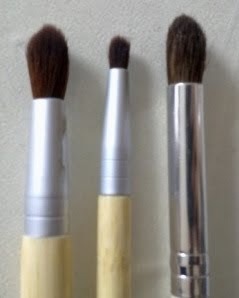 The bristles are very soft and products come onto the brush easily. I have some doubts about it initially cos my lids are really small but now I would say that this is my favourite and most frequent used brush among all. I am not a big fan of this brush mainly cos it’s slightly big for me to be used as a crease brush. However, again the bristles are very soft so I just use this to sweep off any fallout from my lids. I like this brush but have not seen much use of it throughout my trip. 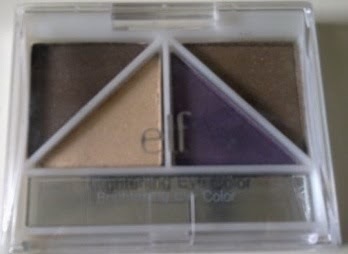 I think its cos I had brought the ELF brownstone quad and had been doing neutral eyes only and the highlight brush and the large eye brush is already sufficient for this kind of eye look. This is my second favourite brush. I used it as a blending brush throughout my trip. 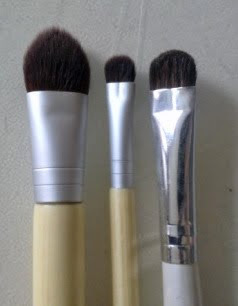 Again, the bristles are very soft and due to the size, it makes blending a lot faster and easier. 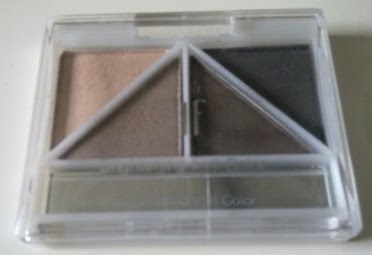 Sometimes I used the brush to pat on some outer corner colours as well. This again is a brush that I had used the least during my trip. It is a great brush to do lower waterline colour and to smudge the lower liner. But I haven’t been using it cos I’m not a big fan of lining my lower waterline. I used this on my friend though and she absolutely loves this smudge brush. I definitely recommend u guys to get it if you're looking for affordable eye brushes. My skin condition was rather bad before i started using Clinique 3 steps (Type 2). Main reason was due to stress and a change in my facial regime. I switched to Olay Total Effects foaming cleanser after finished using my Biotherm cleanser. The Olay Total Effects cleanser made my skin dry and my pores enlarged. During the initial month, the 3 steps really helped regain my skin to its original condition. As i've mentioned here, the only complain i have was that the moisturizing lotion is too oily (I have combination skin). Fastforwarding to week 14, i finished up the system 2 weeks ago and switched to my backup skincare. Did a good job as a cleanser but i was expecting more due to the price & hype from reviews. Perhaps a glowing face or smaller pores? I gotta admit that it leaves my skin clean, fresh and soft. 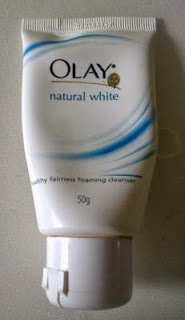 However, my current cleanser (Olay Natural White healthy fairness foaming cleanser) is doing the same thing. And comparing the price, Olay can be bought at less than RM10 (100g) but a bottle of Clinique liquid facial soap is RM 78 (200ml). Verdict: 3.8/5 ; I will go for Olay since it's doing the same job at lower price. This has a strong sense of alcohol in it and it stings my face whenever i have pimples or cuts from eyebrow shaving. I'm pretty fine with the smell but some may find it unbearable. Like the cleanser, it did a good job as a toner for me. It helped my pore size to regain to their original size after my skin disaster. But i did not find it to further minimize them. Now i switched to Loreal White Perfect Whitening Toner, i find that Loreal is doing the same thing to my skin. It maintained my pore size and the better part is that it has whitening effect which i love! I put my toner in the Anna Sui spray bottle for easy & fast application. The smaller bottle is easier for traveling too! Anyway Loreal is a whole load cheaper too (Loreal 200ml RM 23 compared to Clinique 200ml RM 83)! I dislike this lotion. It made my skin really oily and because of that, i never use it as a day lotion. I used it as a night lotion and again i don't see any 'dramatically different' changes in my skin. The only thing it did was to prevent my cheeks drying. I'm currently using my Biotherm White Detox Hydrating Milk Lotion as my night lotion (it was my day lotion). It's doing a better job and i prefer it due to its less oiliness and whitening effect. Verdict: 2/5; I definitely need a new moisturizer after i'm done with my Biotherm as well. Will not repurchased the Clinique one again. I don't think i will repurchase this system again. I don't mind spending more money on skincare but i'm always expecting more results from higher end products and this system was only doing good and decent but not fantastic job. Swatch of Drama. This is one of my absolute favorites. It's great for smoky eyes. The quad has 3 glittery colors and one matte white. 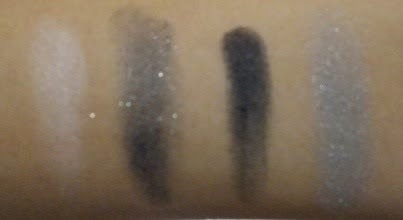 Swatch of Silver lining. All the colors are slightly glittery. Beware of the black though, it's really pigmented and tend to have a lot of fall outs. 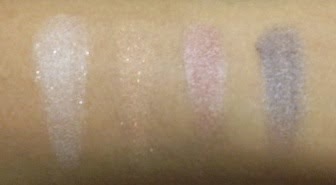 Swatch of Hazy Hazel. I adore the purple and the lighter brown. 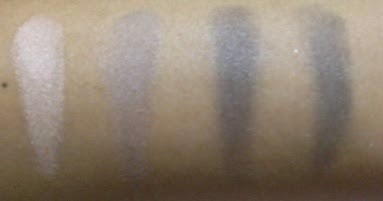 Swatch of Brownstone. 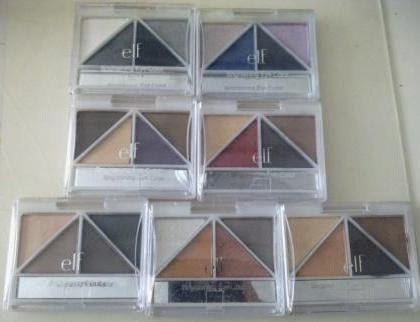 Great matte neutrals. 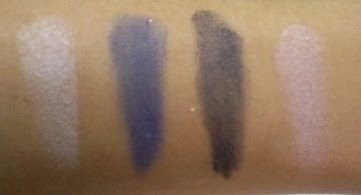 Swatch of Ethereal. This is another of my favorite. 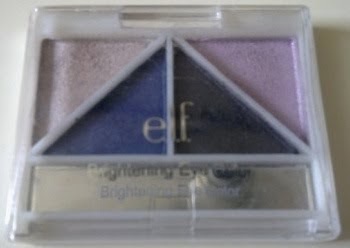 It has 4 great everyday colors (Slightly glittery). Great for lectures. 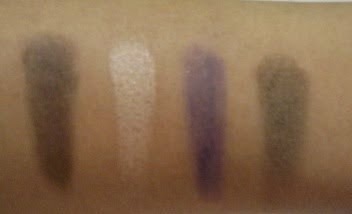 But i do noticed that this us not as pigmented compared to the rest. Let me know if you want more details or to see any looks from the quads. p/s: Apologies for the photo quality as I've taken them using my phone.